In this blog post I will provide information on using the Infoblox "VMware Cloud Adapter" version 3.2 with the new Event Broker feature of vRA 7. This does not require any modification of the Infoblox workflows and the adapter will continue to work as written by Infoblox. This content is intended for readers comfortable with vRealize Automation and vRealize Orchestrator. As always, I do not assume any risk nor do I provide support for using the modifications outlined below in your environment. I will create a workflow wrapper for one of the IPAM workflows to allow them to be executed from an Event Broker subscription. You can download an example of the workflow from VMware's Sample Exchange. I just finished a proof-of-concept with a customer where the Infoblox IPAM plugin for vRA/vRO was used to integrate DDI with vRA. It's a great solution for customers who own or are considering Infoblox IPAM, with one drawback - it currently supports only using Workflow Stubs in vRA version 7. While that's not a huge problem, it lacks the flexibility and usefulness of the Event Broker's Event Subscription capability. If you're not familiar with the Event Broker, you can learn more in this webinar I conducted on vRA 7 extensibility. Briefly though, the Event Broker replaces the Workflow Stubs beginning in vRA version 7. Workflow Stubs are still supported for integrations that have already been built around them, but customers and partners are encouraged to transition to the Event Broker. You can follow the instructions from Infoblox for installation of the VMware Cloud Adapter (which I will refer to as "the plugin" or "IPAM plugin" in this post). The installation will set up the plugin to use Workflow Stubs, and that's fine. If you wish you can skip the steps to create the Workflow Stubs but you will still want to create the property group (we will make some small edits later). If you watched the video I linked above, you will be familiar with a "wrapper" workflow that I provide for usage with Event Broker subscriptions. This wrapper will extract the properties provided by the Event Broker input, allowing you to capture any information you need as inputs for the IPAM workflows. That single input contains most of what we need for the IPAM workflow. There are a couple of exceptions, and I'll cover how to find those. For now, let's start with the easy ones. Next, since I will use the script element "Get payload and execution context" from the EB wrapper, I need to map the output of the script element to those global attributes so that I can update them. However, you will need to make some changes. For starters, the "vCACHost" object is retrieved by the script, but using the var "host" but all I did to fix this was search for instances of "host" in the script and replace them with "vCACHost" as below (the red boxes indicate the two occurrences). For what's worth, the IPAM workflow I am using has as input the vSphere virtual machine object, but it doesn't actually use that for anything - which is great because at the state this is called from vRA the VM doesn't yet exist in vSphere! But, I'm including the code anyway since it will be helpful for other IPAM workflows. I promised no modification of the Infoblox workflows, so I'll stick to that. Ideally, I could change the IPAM workflow to display "Workflow started from Event Broker" and provide the event information. But, just to provide some logging info, I will get the Event Broker payload properties and use that for the "externalWFStub" value so at least that information is logged on run. Inserted below the last code block I added above. With those changes, I now have a wrapper for the IPAM workflow that can be used with Event Broker subscriptions. 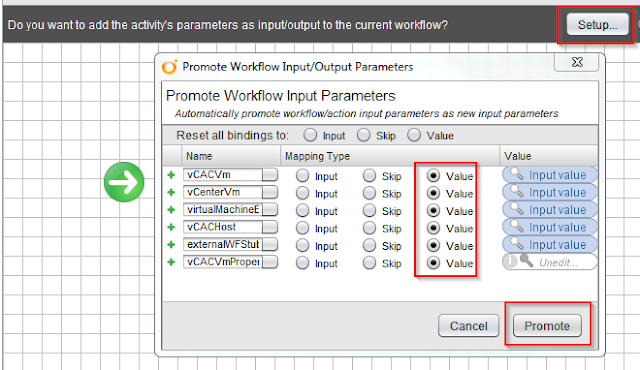 The other IPAM workflows can be used within the same wrapper, although you should verify that the inputs are handled by the wrapper script as I did for this IPAM workflow. 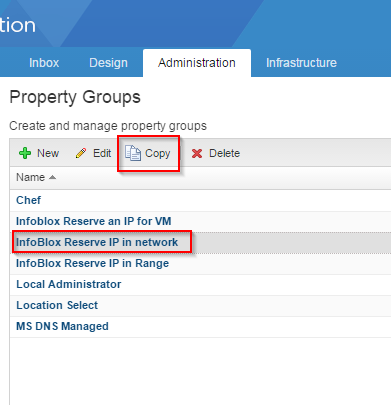 If you followed the installation instructions for the Infoblox VMware Cloud Adapter, then you should have one or more Property Groups in vRA. These property groups are used to pass the property values that the IPAM workflows need. However, these groups also activate the WFStubs and since I am using Event Broker, I don't want those WFStubs to execute. 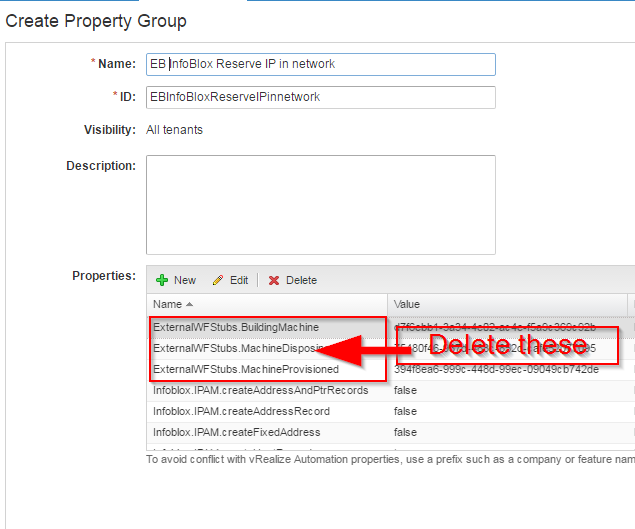 I renamed the new Property Group "EB InfoBlox Reserve IP in Network" and removed any properties that reference WFStubs and saved the Property Group. Now I can associate this Property Group with a blueprint (and disassociate the Infoblox created Property Groups if needed). I used the Lifecycle State Name "VMPSMasterWorkflow32.BuildingMachine" and Lifecycle State Phase "PRE" as this equates to the WFStub,BuildingMachine. I made the Event Broker subscription a blocking subscription with a suitable timeout. Obviously you need IP info or you don't want to continue with a build. There's a lot of duplicate logging of properties between the workflow wrapper and the IPAM workflow spitting out the machine properties. If I were running in production, I'd probably trim a lot of that logging information out or set it for debug only. Finally, keep in mind that this is only for the IP provisioning IPAM workflow. You will need to wrap the IP deprovisioning IPAM workflow as well and create an Event Broker subscription for that. Cannot import workflow. Invalid workflow. Can you post this script in scriptable task? I will add that to the post ASAP. What version of vRA are you using? Hi John, very helpful article, thank you. Is there anyway to include the VC:ClusterComputeResource in the wrapper. I need this parameter to add the provisioned VM into a DRS group. I've been trying a fair few settings to no avail at the moment. Since the wrapper gets the VC:VirtualMachine object, you could just invoke the action getComputeResourceOfVm to return the VC:ClusterComputeResource for your workflow. Hi John that's one of the things I tried however when I use the getComputeResourceOfVm action I get a TypeError: Cannot read property "resourcePool" from null. This is a property of VcVirtualMachine while in input it expects a VC:VirtualMachine type, do you know how this should work? Hi John, I finally got a fix for the issue I was having and I just wanted to report back so that it may help someone else. otherwise the VC:VirtualMachine object is not found. Unable to import the workflow from the VMware Sample Exchange. Error: Unable to import file. Not a valid workflow file. Can you post the raw script code. There is a bug in Sample Exchange. The raw script is included in a link at the end of the post. Thanks for the insights and a great video. Would it be possible to give the workflow file instead of raw script as I am not able to make one myself. Could you please suggest the best way to achieve this ? 3. vRA picks the first available IP of 10.41.246.24 and adds a “Host” name entry for this IP. There is no DHCP server in the environment to leverage. This is making the use a lot of existing workflows a challenge. Be sure to import as a workflow, it is not a package. IHAC who wishes to stick to workflow stubs for now. Are you aware if the process to use Infoblox 3.2 with vRA 7 documented or has someone blogged about it on ?